A lack of dental care can have a detrimental affect on your teeth. Of those adults 30 years or older, 47.2% have a form of periodontal disease. Untended periodontal disease can lead to infections and the loss of one’s teeth. A person’s smile carries a lot of weight to it in modern American culture. Therefore, not only is taking care of your teeth and visiting a dentist’s office regularly a critical part of your overall health, but it’s essential for your own self-confidence. The average time allotted between dentist appointments in the United States is three years, which can cause bacteria to build-up in your gums. This causes your gums to soften and your teeth to potentially be lifted from your gums and out of your mouth. Luckily, dental implants exist in order to treat the gaps that are created by lost teeth. 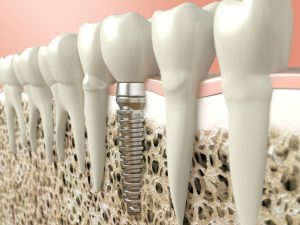 Dental implants are defined as a placement of a metal, screw-like post into the gum and jaw bone with an additional cap in order to feign the appearance and function of a real tooth. If you have had a dental bridge that failed to work for you, dental implants may be recommended in order to fill the gap in your smile. Dental implant surgery depends on the condition of your jawbone as well as the type of implant you are receiving. Oftentimes, a dental implant surgery cannot be performed if a patient has infected gums, the gum is too soft, or if the jaw bone is too weak. If your jawbone is fine, the surgery will take place in multiple stages over a series of months. During surgery, if you have a damaged tooth it will be removed. The dentist will then make an incision into your gum in order to expose the jawbone and drill a hole into the bone. Once your jaw heals, the dentist will then implant a metal post into your jawbone to serve as an artificial root for your new tooth. Again, you must wait for your jaw to heal around the metal post. Once this has been done, your oral surgeon will place an abutment (the equivalent of a metal replica of a filed-down tooth) onto the metal post and then cap the abutment with a false porcelain cap. A dental implant procedure can be a long process, but the results of the surgery provide you with the function and look of a real tooth. You’ll be able to chew, speak, and smile properly within a series of months and without the worry of your new tooth decaying!